President Trump says he has "very little time for watching T.V." But he has lots to say about the news coverage of his presidency. On Wednesday he twice retweeted Fox News; denied reporting from other outlets about White House dysfunction; and falsely claimed that journalists routinely make up sources out of thin air. The tweets provided insight into his thinking -- he is reportedly irritated by damaging news reports about his son Donald Trump Jr. and son-in-law Jared Kushner's newly revealed contacts with a Russian lawyer. The president hasn't held any public events since the weekend, so the tweets are his only mode of communication with the American people. He started the morning by praising Trump Jr.'s interview on Fox News the night before. "He was open, transparent and innocent," Trump wrote. Then he repeated a falsehood he has tried out before -- he said "when you hear the words 'sources say' from the Fake Media, often times those sources are made up and do not exist." If this was a reaction to the Trump Jr. story, it was a head-scratcher. 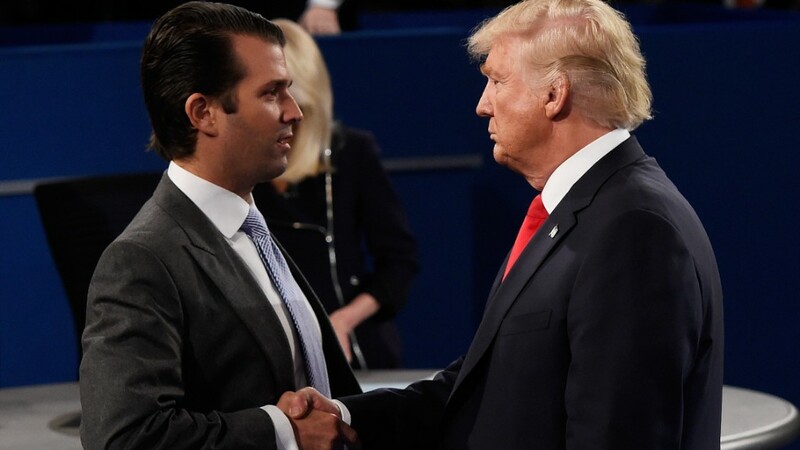 Several days of anonymously-sourced New York Times stories about the mysterious meeting were proven right when Trump Jr. released the email exchange that proved those stories were accurate. Perhaps the anti-anonymous-source tweet was a response to the bounty of other stories about the crisis enveloping the White House. Trump woke up to articles in The New York Times, Washington Post and other papers that compared the situation to a "Category 5 hurricane" and described finger-pointing and infighting among top aides. Trump's assertion that anonymous sources are "often" times "made up" is false -- part of his ongoing effort to demean and undermine the national news media. Newsrooms have rigorous editorial policies governing the use of anonymous sources in stories. Reporters have to disclose information about their sources to their editors. On the rare occasions when the sourcing of a story is called into question, news outlets conduct investigations. What Trump is alleging is "a fireable offense. You make up a source, you're fired," CNN media analyst Bill Carter pointed out Wednesday morning. Trump has a questionable track record when it comes to this subject. He reportedly pretended to be someone else, a publicist named John Barron, to feed favorable stories about himself to the New York tabloids in the 1980s. In 2012, he claimed to have an "extremely credible source" providing him damaging information about President Obama. At the time, Trump was championing the "birther" movement, sowing doubt about Obama's citizenship. He never provided any proof of the source's claims, or of the source's existence or credibility. Trump also used to retweet fans who made spurious claims about Obama. He was widely criticized for those tweets. Staffers in Trump's White House also frequently insist on anonymity when speaking with reporters. One of the anonymously-sourced claims that apparently caught his eye on Wednesday was about his TV viewing habits. "The president is using his relatively light schedule to watch TV and fume about the latest scandal," Politico reported, citing "interviews with half a dozen White House officials and advisers." The report was picked up by some of the morning shows on Wednesday. Both CNN and MSNBC talked about Trump's TV news affinity in the minutes before he tweeted, "The W.H. is functioning perfectly, focused on HealthCare, Tax Cuts/Reform & many other things. I have very little time for watching T.V." CNN anchor John Berman pointed out that "we were talking about this subject (ON TV) just before the tweet." Trump's TV habits were also mentioned in a much-talked-about New York Times Magazine story that came out on Tuesday. Reporter Mark Leibovich recalled visiting with Trump at the White House in June. "It was 12:30, but the president was not eating lunch," Leibovich wrote. "He was watching a recording of 'Fox and Friends' from about four hours earlier on a large TV mounted on the wall." In other words, Leibovich's source was the president.